As a gesture of thank you to my readers, this contest is open to all. This contest expires as soon as someone give me the correct answer. What do you get to win? One of these rings - tiger's eye or pearl, its your choice. I will ship it to wherever you are, provided you give me a valid address. The ring is wire wrapped with gold filled wire, gold filled metal beads and Swarovski Crystals (AB). Guess the correct number of rings in this pile of wire wrap rings (see picture). The first one to guess correctly will be the winner. How to participate and give your answer? Leave a comment (your answer) and if your are correct, I shall keep in touch with you on the details e.g. your preferred stones, size, address, etc. Anyway, if you are interested to make your own rings using the same technique as I used for the rings above, the tutorial for this is available here (look for PayPal "Buy Now" button on the right hand column) and at my Etsy Shop. What a lot of work! Beautiful! I guess 28 rings. This is fun! Is there 27 rings? I am going to guess 32 rings. STOP! Ohh...This is just too soon to end. Kathy, Please email me (meiky6@gmail.com) with your details. I replied your email a while ago. Check it out. huhu..i was late to send my guess..maybe next contest i will try again!! tak pe Yati, maybe next round you have luck. Hi Mei! Wow! Nice work with the wiring! I've nevr tried wrapping wires. Should start soon! Any tips? Visit my own jewelry (handmade) website at www.szeaccessories.com. ok? Thanks! My guess is 27 rings. Thanks! 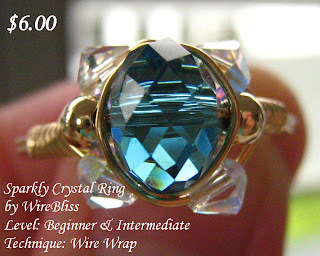 Well, I am planning to write an entry on wire wrapping for beginners soon. Check back soon. thank you for the guess but its wrong. The correct answer was given earlier (see comments above), so the contest already ended officially.